Lately I have been thinking a lot about my wardrobe and what direction my sewing takes meto. In most cases I sew something because I like the pattern or a specific fabric, or I want to try a new technique. This might be ok, but it leaves me with a wardrobe with many single pieces and I still stand before my closet in the morning and does not know what to wear. I have several times tried to sew with a plan, but I always got easily distracted by the next fancy dress or interesting pattern or whatever. Before I started sewing, I did not care too much was I was wearing as long as it fit my budget and kept me warm. When I began sewing, I did have to give more thought to my clothes, but often I bought fabric, because it was cheap and not because I really liked it. I also used to buy those bundles, e.g. „1kg Jersey“, where the colors and size of the fabrics is a surprise. I still have many of those fabrics in my stash (I did not give them away, sometimes I use them for muslins, but that does not work always). So my fabric stash is a mixture of fabrics I love, fabrics I like, and fabrics I just have. Hm. Same for my garments. This is a situation that makes me unsatisfactory. 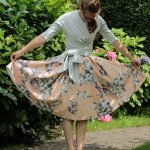 Why should I spent my precious sewing time (and money) on garments that I do not really love and do not like to wear? What a waste of resources. I have read about the „Wardrobe Architect“ from Coletterie and started to work through it. Have you followed it? I have the feeling that this will really help me to build up a wardrobe that suits me and my lifestyle, so I decided to give it a try. I will use this guide to plan my fall/winter wardrobe (as I am a slow seamstress it does not make sense to start with a summer wardrobe with summer already half over). I have already learned so much. For example, I love pencil skirts, but as I go to work each day by my bicycle, I rarely wear them (I could change clothes at work, maybe I should think this over….). The first execises were not easy for me, as I have never tried before to describe my style. I even got the feeling that I do not have any style and that I am still struggling to find mine. But in the end I have come up with styles that I am drawn to, that inspire me and that I am pretty sure do also suit me and my Lifestyle. I have put them together here. You can see that a few pictures are titled „inconsistent“. These are styles I am drawn to, but would not wear (I only dream of it) but it inspires me and its also a part of me and what I like, so I included this in my board. The next step are colors and how to fit them into the wardrobe. I am pretty sure about my favourite colors so I think hope this step will be easier for me. I am really excited and can’t wait to plan and start sewing my new wardrobe. As Sarai from Coletterie said, if you are confident that your plan will work, you will not get distracted easily and are also more willing to spent money on more expensive fabric or garments. 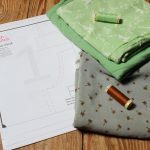 Do you sew with a plan for your wardrobe?